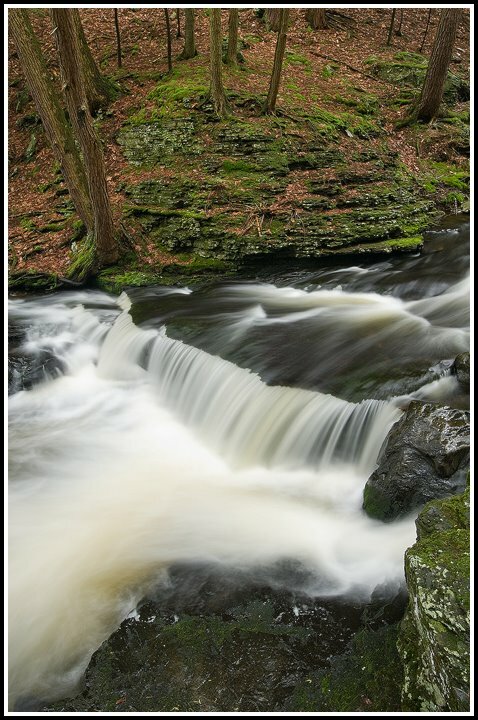 Back in early Spring, I spent two days photographing the many waterfalls and stream scenes of the Delaware Water Gap NRA. Spring is often a good time of year to photograph scenes with water features. They seem to be flowing highest that time of year. This photograph in particular was taken just upstream of Deer Leap Falls in George Childs Park, just outside of the NRA. When photographing scenes like this, overcast or soft light is often ideal. A polarizing filter also helps immeasurably with removing glare from the wet rocks and allowing for use of a longer shutter speed. I used a shutter speed of three seconds, to show the motion in the water while still preserving a bit of detail. It’s important to experiment with shutter speed, especially when shooting a scene with moving water. For some subjects, you may find that you like the way a half second exposure looks, but for others, you may prefer fifteen seconds. It’s really up to you. Hi everybody, my name is Alex Mody. I’m a seventeen-year-old nature photographer living in Vienna, Virginia. I’ll be posting here a few times a week with field updates, “how-to” posts, and trip reports. I get out and photograph as much as possible, and I hope to share some of my experiences with you though this blog. This fall I will also be going on an extended trip throughout the country, and I plan to blog extensively over the course of my travels. Here’s a photograph I took in Maine this June. 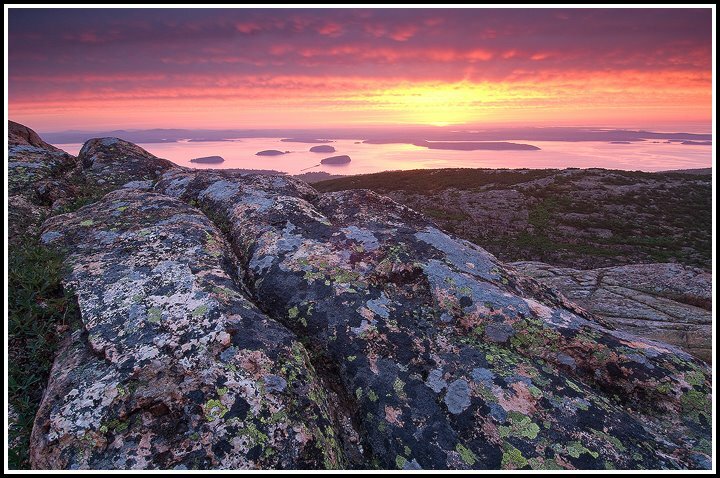 It was taken in Acadia National Park from the summit of the famous Cadillac Mountain. Instead of opting for the “typical” image from the top of the mountain, I set out to find an interesting foreground that would hopefully block out the harbor lights, thus creating an image with a more “natural” feel to it. Please visit my website at www.alexmody.com to see more of my work. I spent five weeks in Badlands National Park earlier this year as an Artist in Residence. Everyday I explored the park with my my camera. It was often very chilly and there were not many people in the park during the winter. While I was shooting I tried to remember to take images that I could stitch together to make panoramic images. My friends kept telling me how easy it is to automate paoramic stitching in Photoshop CS3 and I wanted to try it when I got around to upgrading from CS2 to CS3. I took many series using my tripod and panning to take images in a row, both vertically and horizontally and I overlapped each image by about 1/3 to make sure that Photoshop would have enough information to stitch them together. Finally I’m reviewing images and have gotten around to stitching some of the panoramas. It really is incredibly easy. 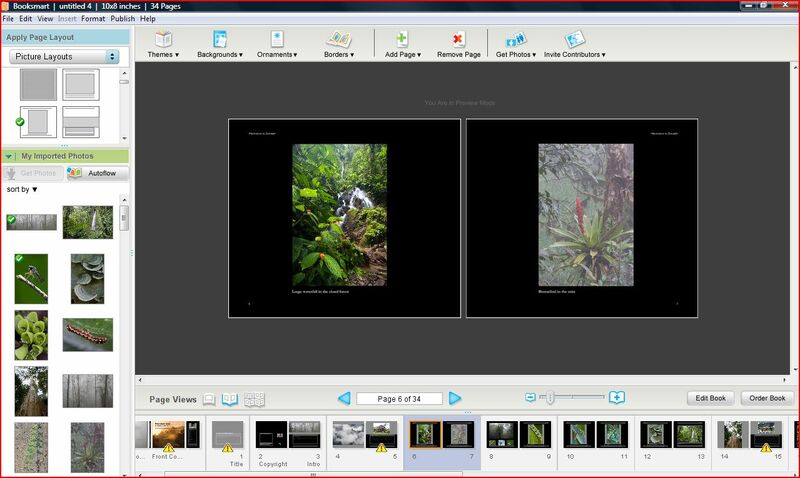 You simply select the “Photomerge” tool under “Automate” in the “File” dro-down menu, select the images you want to stitch and click OK. Check out some of the results. I was recently at a friends house and he pulled out a few photography books to share with me. I was suprised to see that they were actually his photos. He put together books through an online software, designed them, and had them printed. They were high quality and very professional. But, they were mostly just really cool. Self-publishing used to be a major undertaking, but he explained the process to me and it seems that it has become easy and an open market for anyone. So, I decided to try it out. After spending a few hours reseraching companies online, I decided to go with http://www.blurb.com/. I’ve also heard great things about http://www.mypublisher.com/. I was shocked to find that it really is easy! You simply download the free software and use their templates to create your book. You can choose hardcover or softcover, the number of pages, and of course all of the colors, designs and page layouts. Just upload photos from your computer and pop them into the pages. Best of all, when you roll over the picture boxes, the optimal size in pixels shows up for each separate box. In about 15 hours I created a 30-page book of my images with text and captions. After you review the book, you just click order and I couldn’t believe it, but the hardcover books are only $29.99! They print them in 5-6 days. I’ll let you know how the books look when I receive them, but as of right now, I’m incredibly pleased. They will make the best personalized gifts or photography portfolios! Check it out online. The first online issue is now live on our website (www.naturesbeststudents.com)! This took a lot of work over the last week to get things up and running and to make sure the site is fully functional. We are hoping to add more videos over the next few weeks. It is so exciting to create a new product that is accessible to students and teachers all over the world. Hopefully people will begin to pass it around. 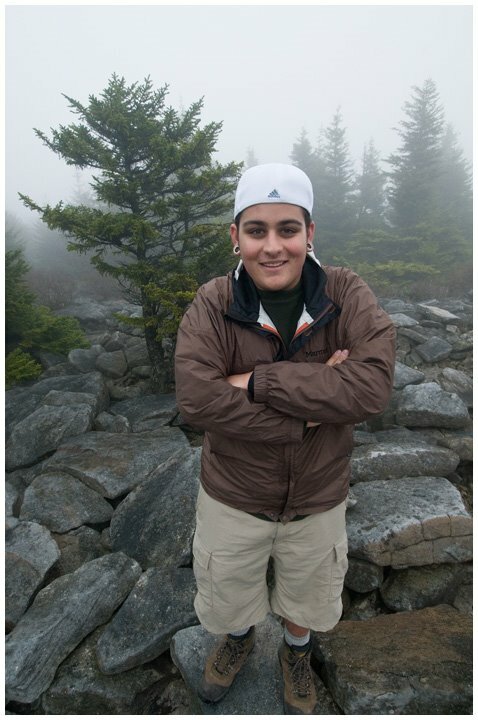 Now that we are done with basic website updates I’m thinking about updating my personal website (www.gabbysalazar.com). I’ve been researching web templates and have found some nice companies. My favorite is http://www.photobiz.com, but their hosting fees are expensive. I’m also in the process of getting together all of the photo contest entries at the moment. The judging will take place in the coming weeks. I’ll post some more pictures soon! 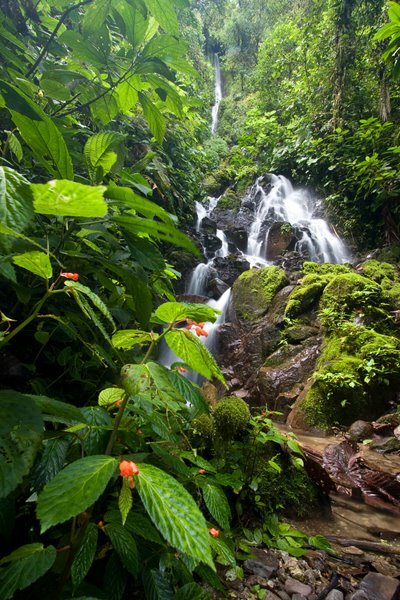 Check out this video from the cloud forest of Ecuador. See below for the photo I took of the waterfall shortly after we made this video. This morning I woke up early to go for a run before work. It was difficult to get out of bed, but with the online magazine launch scheduled for Friday I needed an energy boost. While I was doing a few warm up laps around the driveway, I noticed that there were dozens of earthworms attempting to crawl across the gravel drive. The worms were coated in the gravel dust and many were struggling to move. I continued on my run, hoping to get in 30 minutes before I had to get ready for work. On my way back to the house, I noticed the worms again. It was clear that many would perish – either death by dehydration or by car tires. I decided that being a few minutes late was worth saving a few of the worms by relocating them to a local field of grass. Little gestures are important.